Storm Katie swept across the country this week, bringing yet another wave of high winds, hail and thunderstorms, which has kept me away from shooting duties, but a window of sunshine was forecast and I set out for the equestrian centre a dozen miles to the north. Guessing that the ground would be waterlogged, I took my home made shooting sticks with me to give stability for distance shots, as getting down prone would not be pleasant. Pulling the van into the stable block, I walked over to the owner and asked where the rabbits were. A man of very few words, he said “Everywhere!” As if to rub our noses in it, a rabbit hopped out of the hedge next to us, took one look and bolted back. 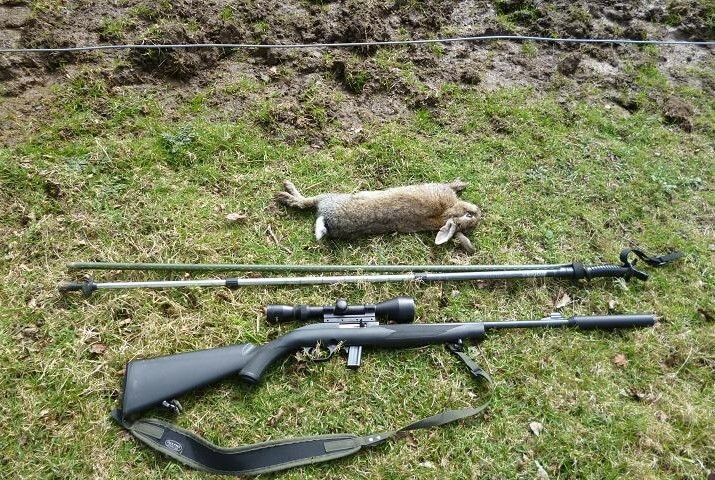 Walking away from the buildings, I could see a rabbit out on it’s own in the middle of a near flooded paddock and managed to get within 50 yards in the cover of a fence, before I set up my sticks to form a bi-pod for the rifle. With no holdover needed at this range and the stick legs firmly set in the soft mud, the side on chest shot hit target with a thud. As I waded out to get this rabbit, I was reminded of a folk law that says that rabbits don’t like water; well this one did, it’s lower body was soaked. 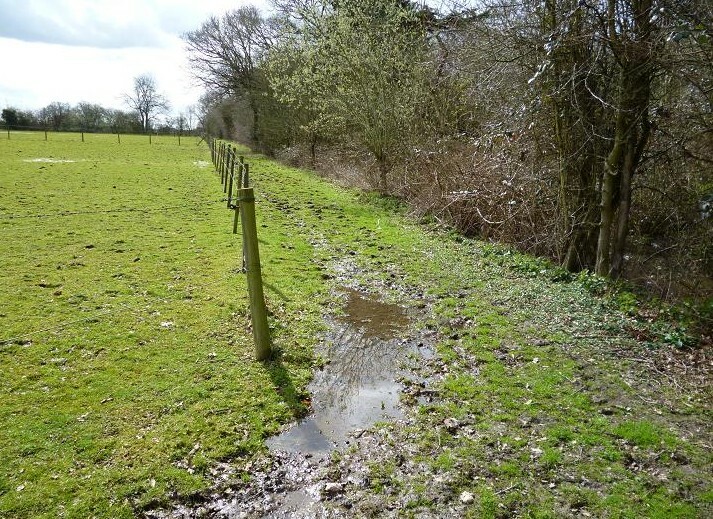 The warren here is in the brambles, the ditch to it’s side flooded close to the path, forcing the rabbits above ground. 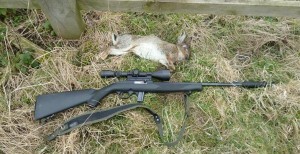 With my hands full, I cleaned out the rabbit at the pathside and popped it into my bag, before moving on. As I crossed the bridge over the ditch, there was movement ahead, rabbits on the path running in all directions, but not offering a target, although one ran ahead along the next ride and I quickened my stride to follow. 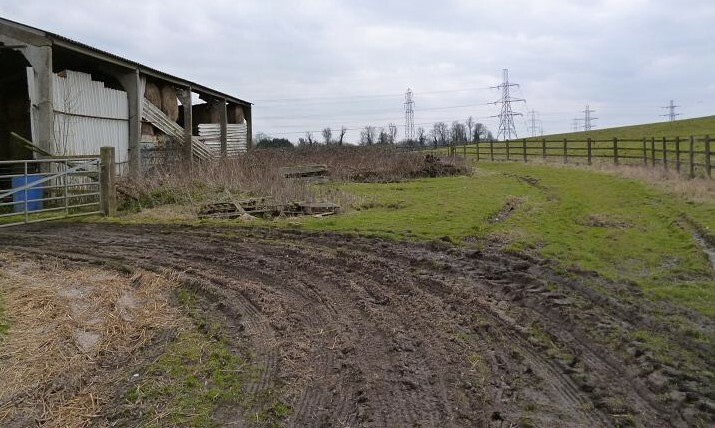 The paddock was a mass of mud and the rabbit had stopped, possibly considering how it could double back across it, when my second shot off the sticks claimed number two. Cleaning out this second rabbit, the pitter patter of heavy raindrops warned of a fast approaching storm, looking up to see the sky black and streaked with hail. Number two bagged, I hurried back into the wood and made my way down to the shelter of a big flat branched cedar, scattering another group of rabbits feeding in a clearing, but this time was more concerned by the advancing hail, than filling my bag. Pressed against the trunk, the worst of the storm was dissipated by the overhead canopy and I watched a full tailed red fox run into the protection of the trees from the exposed paddock. During my wait, I topped up my ten shot magazine with more RWS hollow point subsonic .22 bullets in the hope that the sun would soon replace clouds. 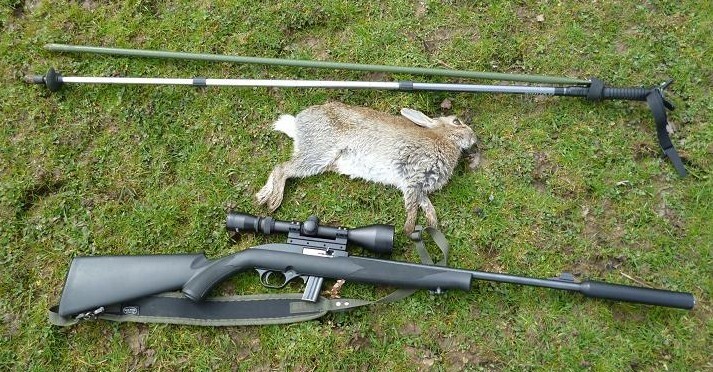 While cleaning water droplets from the scope lens, a movement made me look up to see a rabbit fifteen yards away and in slow motion I raised the rifle, only to see it disappear beneath the ground into one of many burrows. A few minutes later a set of ears popped up, then down in another spot. This is an old badger set and I think the flooded out rabbits have found a new dry home, until the badgers return. The sun was back out again and I retreated further into the undergrowth, where I had a good view over the clearing from a fallen tree, splaying out my sticks to cope with a comfortable sitting position. Like a horror movie, I kept seeing movement in my peripheral vision, only to turn my head in time to see a furry back, or white tail disappear again. It was like they were playing with me, a potentially lethal game of hide and seek. Twenty yards away the top half of a rabbit emerged, I swung the rifle and fired. It dropped back. Missed it. Rabbits have the ability to suddenly appear in the open and ten minutes further on, the silhouette of one sat in the shade beneath a holly bush, a minute after I had been looking at the empty spot. 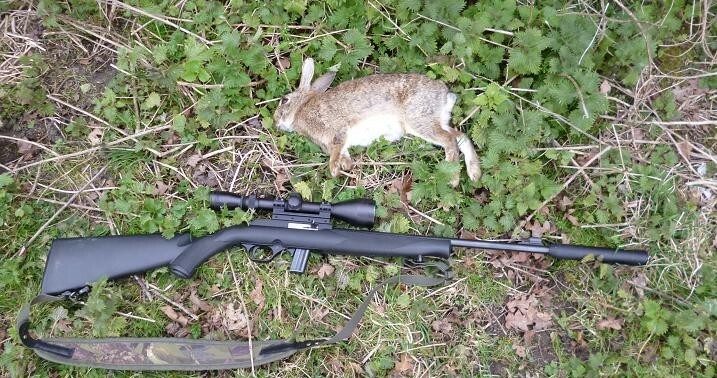 The rifle was already on the bi-pod and the rabbit fell over like a fairground target. Suddenly the downed rabbit was bounding forward. Missed again? I swung and fired as it’s body filled the cross hairs. The rabbit was still kicking and I made sure with a studied head shot. The rapid fire of the semi auto scoring again. I waited another ten minutes to pick up my rabbit, only to find the hind legs of the first rabbit that I missed, protruding from the hole that it had fallen back into. Picking it up, I saw an entry wound in the back of it’s head. A perfect shot. Going over to the final rabbit, I saw the white underbelly of another beneath the holly bush. In the shade I’d obviously only seen the one, which I shot, the other bolting forward into my sights. It was already clouding over again and by the time these were bagged up, rain was falling again and I made my way back to the van, the bag heavy on my shoulder, ignoring more rabbits as I walked. Unloading my gear, the owner was chainsawing logs and looked up. I held up my open hand and mimed “Five.” He put up his thumb in acknowledgement. As I said a man of few words. According to the calendar, summertime has officially begun, but as I headed north toward a small farm at the foot of the Chilterns, I was met by leaden skies and a light drizzle. 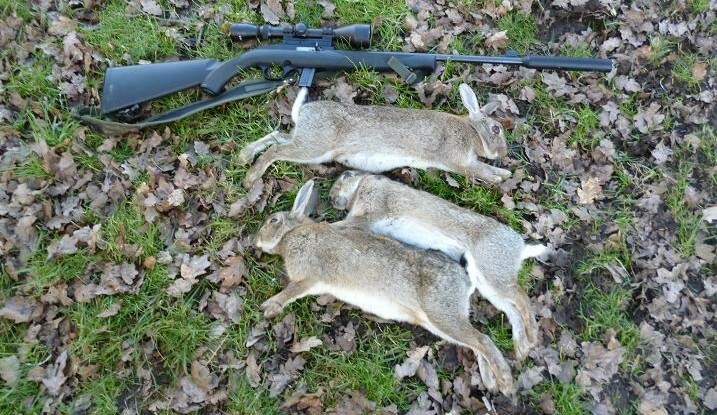 The last visit had been on a balmy October afternoon and the days had been ticking by since then, building up to a long overdue six months, during which time the rabbits had been able to build up their numbers with no interference from my rifle. Driving along the lane up to the farm, I could see a few rabbits quite happily feeding in a small paddock and coasted the van to a stop just out of sight in the yard. The Magtech was out of it’s case, a magazine clipped in and the action cocked in a minute. Creeping round the back of the van, I stuck my head out to see the rabbits still in place feeding, apart from a doe sitting up on guard. At thirty yards it was a gift shot, but bringing the rifle round to rest against the rear door, being a righthander, I had to expose my whole body and she stamped a warning thump, before turning to run, the bullet hitting the side of the head with a whack. There was no time for a second shot at the others, they were bouncing their way to safety through the fence in an instant. That was quick, I hadn’t even managed to get my jacket on. 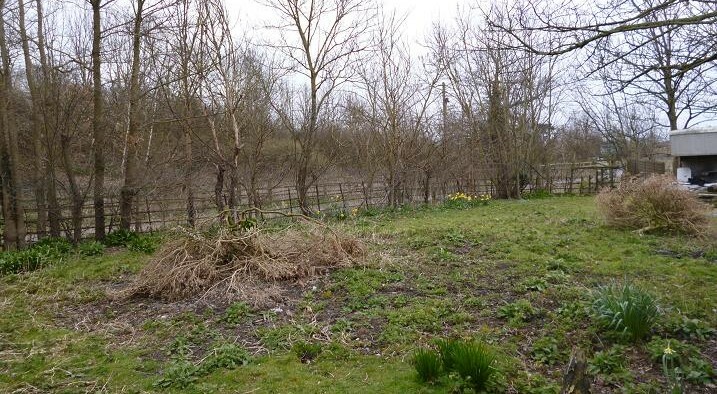 The paddock sits on the eastern boundary of the farm and I walked to the fence to see half a dozen more rabbits feeding beyond. 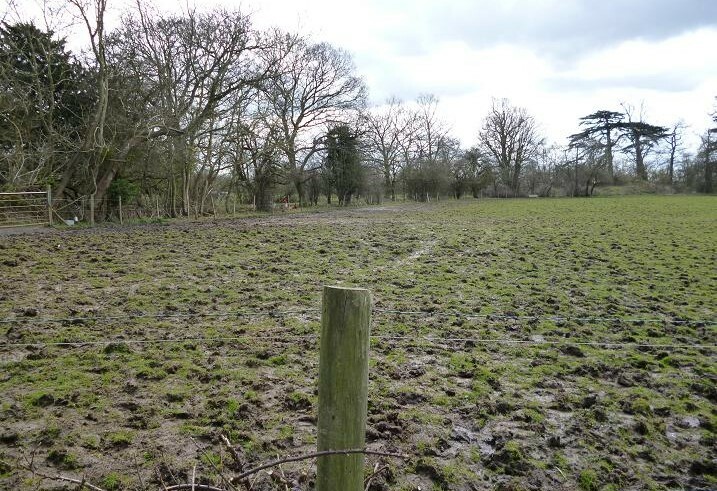 I have no permission for this land, the owners leaving it fallow apart from a couple of horses. The rabbits pass through the fence from this safe haven to the farm and having gathered up my kill for cleaning, I returned complete with the camo net and jacket to wait in the cover of a rubbish heap. The run through the fence is well worn and I lay down with the rifle rested on my bag. The scope focused on the empty gap for ten minutes, then twitching ears appeared, seconds later followed by a head. 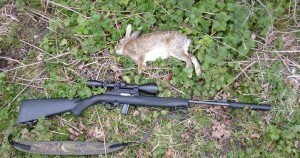 Almost as a reflex, the trigger was squeezed and the rabbit jumped forward. I probably should have waited for more to come through, but a bird in the hand is worth two in the bush they say and I got up for another collection. This was a big old battle scarred buck with well chewed ears, that wouldn’t be passing on any more of his genes to the young does. Putting my camo net back in the van, I saw movement ahead near the barn and moved forward for a better look, the scope picking up three rabbits and a very young kit chasing round in the lane. With a metal gate in the way, there were no clears shots and kept low along the fence, until one stopped long enough. Being framed by the metalwork, I took the shot, knocking it down, while the others continued their dance and I searched for another clear target, getting too close, before they ran off down the lane. Passing through the gate and negotiating the muddy tractor ruts, number three was another buck, the forty yard target hit squarely in the head. Light drizzle was giving way to spits of rain and I decided that three was enough. 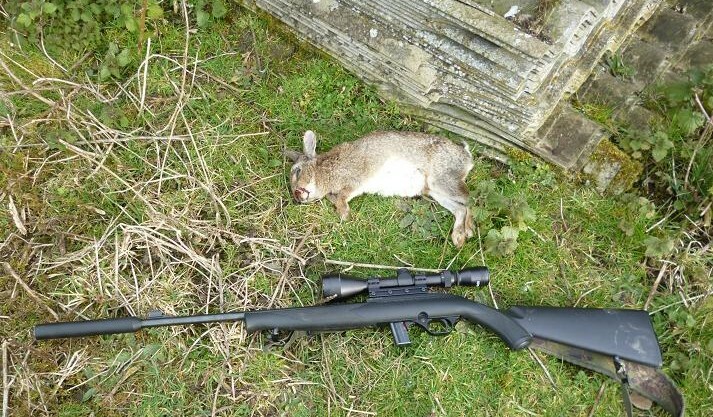 My aim had been to call in at the farmhouse before I left, so walked back to the van to lock away the rifle, only to spook a rabbit on my way, which crossed in front of me, then away along the fence, catching it in the crosshairs as I followed it with the rifle. Being lightweight, the Magtech is ideal for this type of rough shooting, tumbling number four with an upper body hit from the RWS .22 hollow point bullet. Stowing my gear, I met the lady of the house, as she was coming out to feed the geese, unaware that I was even on site. An older couple, they restrict their farming these days to renting out grazing and tending their vegetable garden. Having no love of rabbits, they are happy for me to come and go as I please. Today I did not reach the veggie patch, the rain falling steadily as I climbed into the van. 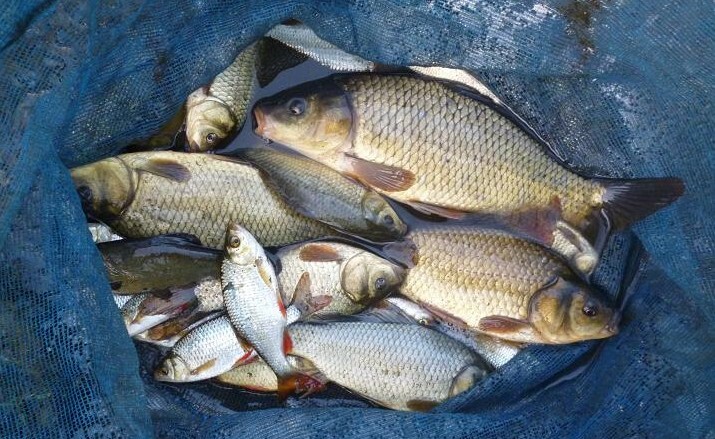 The last day of the coarse fishing season was all planned out, buy a white loaf from the local supermarket, whizz it through the food processor, having saved a few slices for hook bait and drive the ten miles to a free stretch of a small river, where big chub are the target. Recent floods had kept me away, but today the sun was bright and the meandering river would have fined down enough for trotting a bread bait through some of it’s deep pools, which also hold some nice roach at this time of the year. Setting off, the van got to the end of the road and stopped. Restarted, it reached the next roundabout and stopped again. My anticipation was disappearing fast as I struggled to keep the engine going at the traffic lights. There was nothing for it, but to abandon the mission and return home, the engine dying again as I drove onto my drive. All you petrol heads out there will be shouting “Idle control valve!” Yes I know too, but by the time the offending item had been located, stripped and cleaned out with carb cleaner, and the van test driven, the sun was already dropping in the sky. 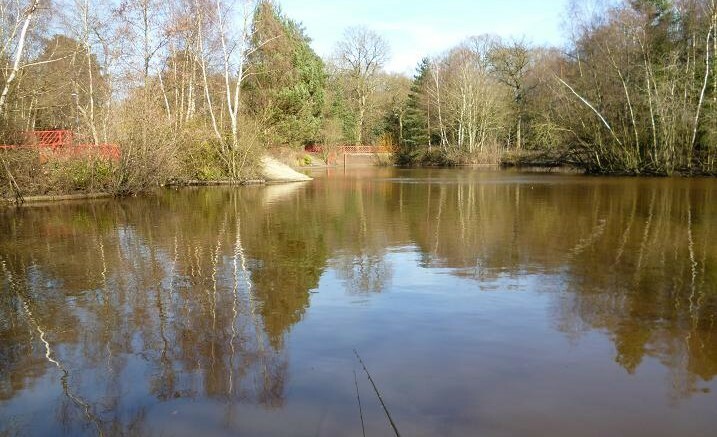 If I was going to fish, it had to be close and where better than the duck pond with it’s fat, bread fed carp? The mums were out in force feeding the ducks and I walked to a deserted area of bank within casting distance of a small weir, which drains water from the surrounding housing estate. Before setting up, the coarse crumb intended for chub, was mixed with ground carp pellets and water, the soft balls thrown in a line from the outlet twenty yards away, the geese and ducks concentrating on the free offerings being presented on the other side of the island. The rig was simple, a 3 AA peacock waggler attached to a foot of 4 lb line with a size 14 barbless. 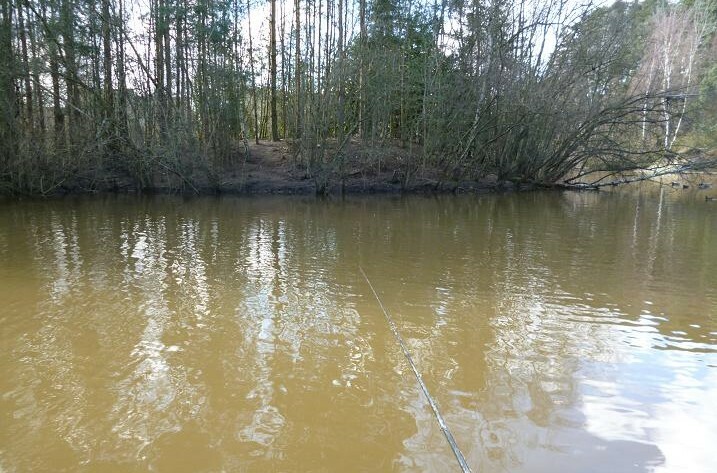 Casting out, I settled down to wait for a bite, pleased to be fishing at last, all be it far from the intended river and those winter chub. A bitterly cold east wind was blowing in my face and now was aware of the heavy clothing discarded to work on the van in the sheltered sunshine of the driveway, not replacing it in my haste to get fishing. Time to call home. My wonderful wife answered and agreed to walk over with a thick hoody, just as the float sank from view. Missed it! I was probably on my fourth missed bite, when the cavalry arrived, baring extra clothing and a custard tart to improve my mood. My wife didn’t stay long, we were now in the shade of the houses behind and it was getting colder. I agreed that I needed my brains tested to be sitting there and she left, the float sinking away minutes after, to be met by the satisfying sight of the rod bent double, as a powerful fish ran for the island. This was what I came for and countered each run with a backwind, the carp’s scales standing out in the sunlight, when it rolled. These carp are like barrels and in perfect fighting trim, the hook dropping from a tenuous hold in the outside of it’s lip. I am sure they do not need the food, but enjoy playing with the pellet of bread, getting caught being the occasional hazard of their sport of exasperating the angler. Returning this carp, I was surrounded by curious school girls, who for a minute broke away from their chatter to take selfies with the strange old man and his fish, before continuing home. Cheered by the interlude, I recast only to miss another bite as I settled the rod. They were on the 6 mm punched bread, as soon as the float settled, the tip dipping and jarring, often to be ignored for minutes on end afterwards. 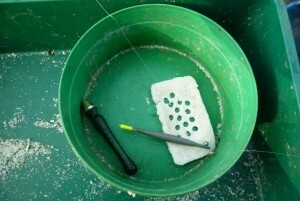 The rig would be retrieved with the bait still on the hook, but would come off with the slightest wipe of my finger. This game continued, the float holding down with the line tightening, unmissable. Strike. Nothing there. The float was still illuminated by the sun, but I was being chilled by the wind in the shade. A smaller hook and pellet may have worked, but all I now wanted was another fish and to go home. At last the rod went over and I was into a much smaller common that began zigzagging it’s way toward the landing net, making a last gasp dive beneath it, just to keep me on my toes. Honour regained, I slipped this two pounder back and hastily packed up, pausing to remember previous last days of the coarse season over the years, most of them sunny and warm. Walking to the van, I stopped to take a picture of a harbinger of spring, wild primroses, their pale yellow flowers shining out from along the path. After a cold foggy start, the sun came through and suddenly it was spring, inspiring a walk to a nearby park, passing along the way my local pond, which has been undergoing work by the council for months and sealed off by a workman’s fence. 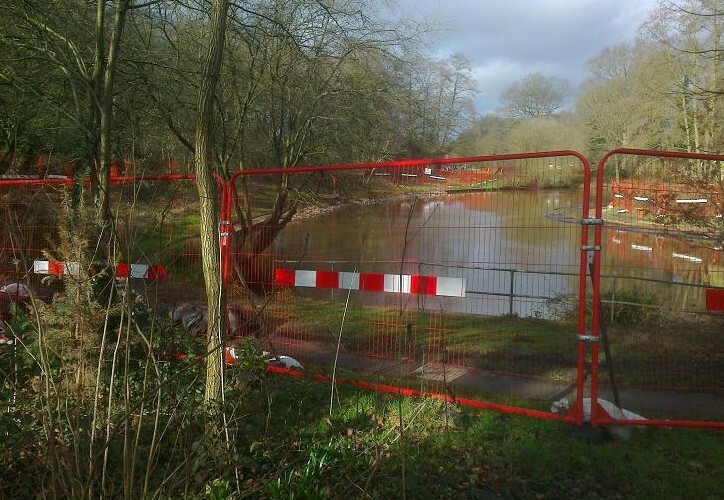 The finish date of Christmas had come and gone as contractors worked to renew the paths, and soften the brick edges with reeds, adding the bonus of a couple of fishing stations, while they were there. Today the barriers were gone and I resolved to walk back after lunch for a final fishing session before the end of the coarse season. Travelling light with only a pole, landing net and emptied tackle box on my trolley, the pond is a brisk 5 minute downhill walk from my home and by 2:30 I was set up and ready to fish. Intending to use my default method the bread punch, on arrival I had lobbed three balls out to an area 8 metres out. In summer the surface is dotted with rising rudd, while carp nose around in the lily beds, but today there were no signs of fish and wondered whether the environment agency had carried out their threat to net the water to ease overcrowding. First cast in the float tracked off to the left and I lifted into a rudd, the 5 mm bread pellet taken well down in seconds. Not the biggest rudd of the afternoon, but the first of many, the fish very cold to the touch, an indication of the low temperature of the pond. 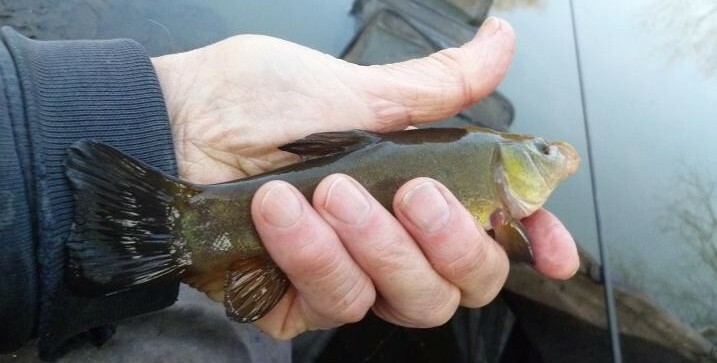 A small tench broke the succession of silver fish, the golden tench staying deep until the net, it’s size belying it’s power to weight ratio. 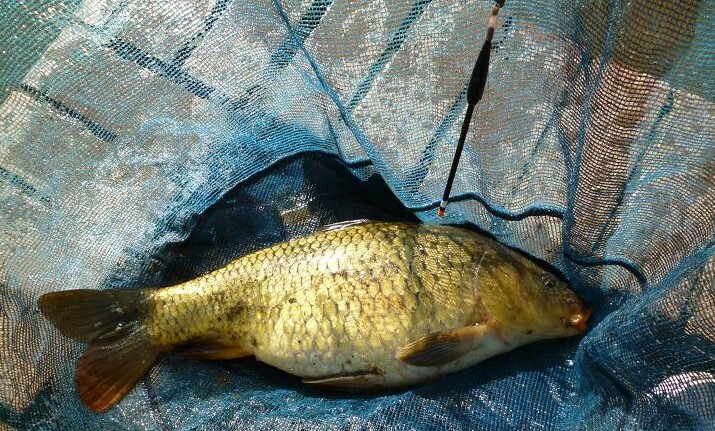 Next cast the float lifted and held as a small crucian mouthed the bait, the hook holding on the outside of it’s lip. 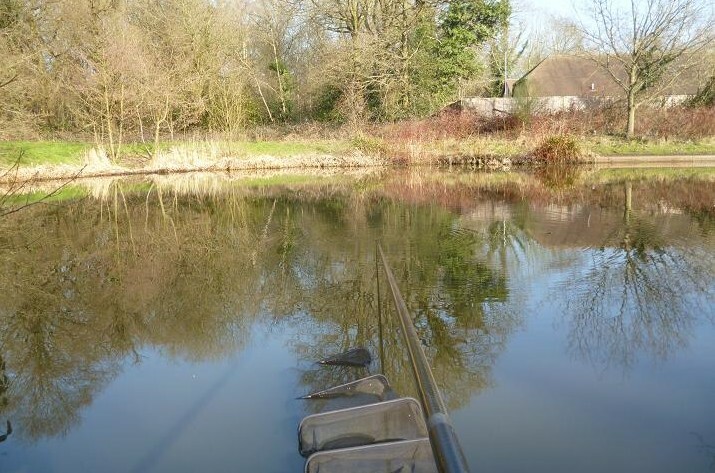 Back in again, the small 3 No 4 waggler float never settled, sinking slowly away, followed by the pole elastic as I lifted into a pound plus common carp, that erupted onto the surface of the shallow pond, before coming to the net. 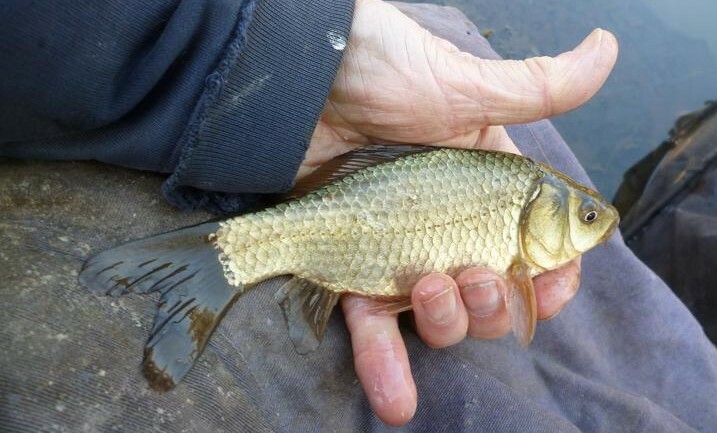 The rudd were now absent, their place taken by a succession of small crucian carp, any sign of a bite, usually bringing a fish to the 5 mm pellet of bread. The elastic came out again with another small common, this one burying it’self among the lily roots to my right, needing several attempts to allow it to swim free, the hook staying put long enough to bully it out. 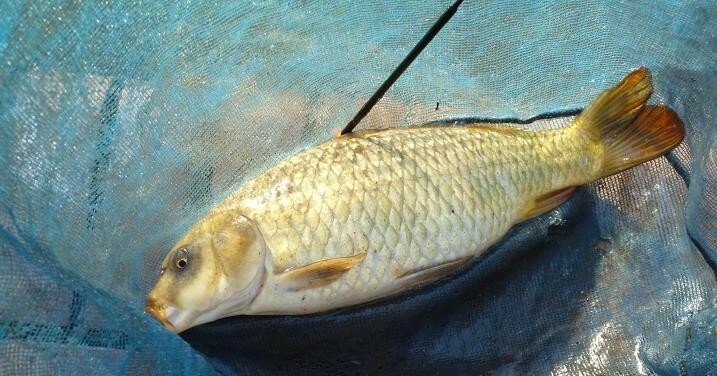 Many of the carp in this pond are crucian/common hybrids, this one being an example, they all fight well, so who cares. Next up was a true crucian with it’s upturned mouth and fighting in short juddering runs, again the hook was just outside the lip. At this point a couple of young anglers, fishing after school, came up to see me net this crucian, saying that they had nothing, while watching me pulling them in. Could I help them catch? I demo’d a couple of small crucians on the punch, before going down to their rods. Where do you start? The rods were too short, the lines too heavy and their floats too big. They were using fresh bread flake squeezed hard onto a size 14 hook, the fish only able to knock the bait, while dipping the floats that stood an inch out of the water. They were using wagglers, which was a good start, being easier to cast and they had a mixed pot of split shot. With the floats shotted down to the tip and just a pinch of bread wrapped round the line, then pulled down onto the hook, they both had rudd in minutes. Good deed done for the day, I returned to my swim to find that algae had lifted off the bottom to be blown into my swim, Making it difficult to find an opening for my float. When I was successful, the crucians were still feeding, bubbles coming up from the muddy bottom. 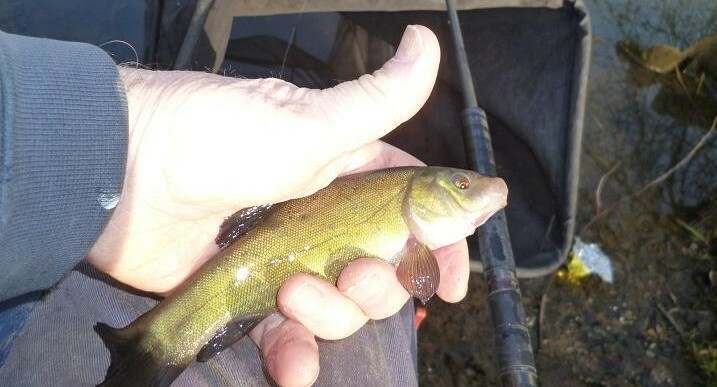 Another small tench, this time a deep green fish gave variety. Very small commons had moved in, but my last fish was a silvery crucian from an area now covered in algae and I decided to pack up before my 5 pm deadline. The lads were back to see my final bag of over 30 fish and were pleased to report half a dozen rudd between them. I hope that they will have learned something from their outing and will want to continue fishing. Various issues with a couple of my motor vehicles, left me with no time to consider the thought of fishing this week, but with an MOT pass certificate in my back pocket, I ventured out to my local lake this afternoon, the lighter evenings giving me time to salvage the rest of the day. Bright sun had taken the edge off a bitter wind, when I arrived at the waterside, but the sight and sound of about twenty Canada geese beating up the surface, as they competed for mates, made me think twice about tackling up. 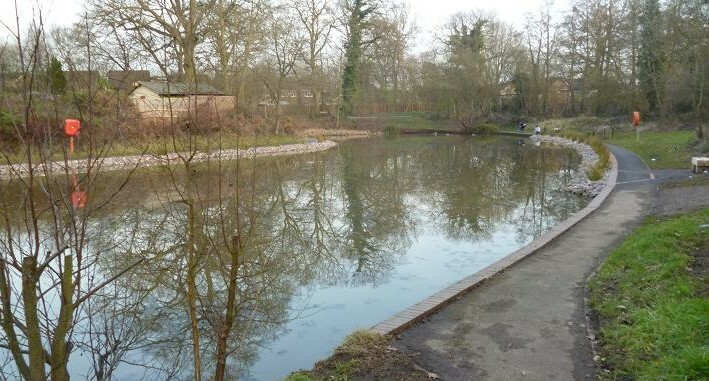 In the middle of a housing estate, the shallow lake is home to moorhens, mallard ducks and coots, being joined by migrating mandarin ducks and Canada geese in winter, which act as a magnet for mothers with small children, all keen to dispose of bags full of stale bread, scattered to the feathered occupants. Beneath the murky surface, the unseen scaly residents grow fat on the remainder, bread proving to be the best bait for the plentiful wild carp. 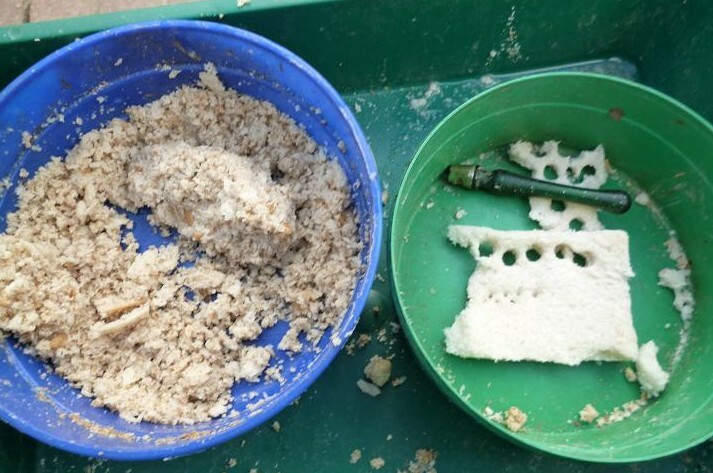 Before setting up my rod, I sprinkled ground carp pellets over some rough, food processed crumb, before mixing and adding just enough water to hold a ball. Waiting for the geese and company to crowd round the latest giver of food, I lobbed in several balls toward the island, which broke up three quarters over. Being only two feet deep, firmer balls would sink whole into the mud, while these soft ones scattered over the surface. With the ducks preoccupied, the bread feed had a chance to get through to the bottom. By the time that I’d set up with a short 3AA bodied waggler, bubbles were already breaking the surface in the fed area, my first cast seeing the float tip dip, then cruise away, lifting my rod into a carp, that dived back to the safety of the island. My rediscovered twelve and a half foot Normark carbon rod buffered that first run, pulling a carp to the surface away from the obstacles and toward my net. A fat 4 lb common carp first cast was a good start, but reality set in with a series of missed bites. The float would dither and dip, then sail away without contact on the strike. Eventually the size 14 barbless hook found a hold and a larger common was testing the Normark as it ran along the island edge in search of a snag, constant pressure turning the lump, bringing it out to the open water and my waiting net. This one rolled onto my waggler and snapped it, to be replaced by a home made peacock quill, my tackle box being a time machine full of items produced in my youth. 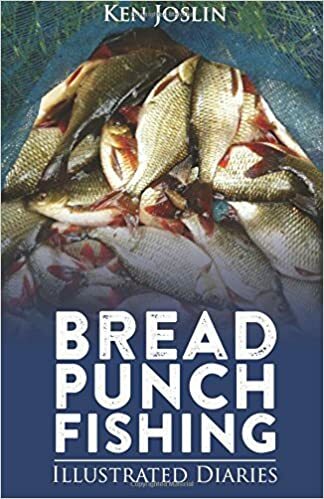 I had been using a double punched 7 mm pellet of bread on the hook, thinking that this would be more attractive to the carp, but now reasoned that, as both fish had been hooked in the outer part of their lips, the pellets had masked the hook. The new float was pushed into the rubber sleeve connector and cast over needing no weight adjustment, settling with just the orange tip showing. Within minutes the float blinked off and on as the bait was blown around by another fish, going off long enough to allow a strike, which connected with a carp that ran all over the place, at one time fighting hard under my own bank before finding the landing net. The single pellet worked this time. Three carp in an hour and plenty of action in between, not bad for an afternoon, when I was about to be blasted by sleet and snow, then icy rain for ten minutes, before the sun came out again. Believing the forecast of sunshine, I’d not worn a jacket and needed to pull up my hood, putting on my old bait apron for extra protection, then hunkering down until the clouds passed. The geese were being fed again further along the bank and I took the opportunity to mix up some more bread feed to ball into the swim. At home only a half mile from the lake, my wife saw the sleet and took pity on her crazy husband, preparing a flask of tea, along with a seasonal hot crossed bun, then making the walk to where I was sitting shivering. Warmed and fed, another single pellet was slipped onto the hook and I cast out again, giving my wife a running commentary as the bite developed, only to strike too soon, bumping the fish, that swirled away in a muddy bow wave. Plenty of bubbles indicated more fish in the swim and the next cast pulled into a longer fish, which I first thought was a grass carp. Not impressed by the cold wind, or the angling prowess on show, my wife was soon heading home to prepare our evening meal. Shortly after, I began to battle the biggest carp of the day. A decisive bite struck into a carp that ran both ways down the island, with me taking and giving line as it rolled around in the muddy lake. This time the rod was bent double with the weight of the fish alone, the reel clutch ticking away absorbing each run. With 6lb main line to a 4lb hook link and a forged hook, it was just a case of taking my time to wear the carp down, slipping the net under it after five minutes of arm wrenching effort. A stepped up carp rod would have done the job quicker, but the heavier tackle may not have fooled the carp. A perfect common carp with not a scale out of place, from a rarely fished public water, returned to grow and fight another day. This fish capped the day for me, five fish in two hours for over twenty pounds in total was enough and I packed up, returning to a warm home and hot tea.